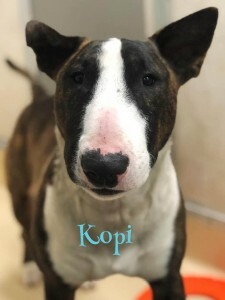 Kopi – Visalia, CA – – Foster/Foster-to-Adopt Home Needed | Bull Terrier Rescue, Inc.
Kopi is entering our program as his owner had to unexpectedly relocate due to work and could not take Zena and Kopi with her. This sensitive 1yo guy is very playful, and can be initially shy/nervous around strangers until he gets to know them. Per the owner surrender form, he is good with children, cats and other dogs. Both have been wonderful in the shelter playgroups. Kopi is crate trained but will likely need a refresher in house and leash manners. Kopi may guard his food and toys; the shelter staff has been able to take away his food bowl and toys without any issues but he could be subdued in a shelter environment. If your information is not yet on file, please complete our online application: http\://www.bullterrierrescue.org/?page_id=572. Please contact Suz at suz@bullyhaven.org or 415-672-7391 if you have any questions about this sensitive guy.